The Spitfire is an icon of World War II, becoming the darling of the British public through defending the skies during the Battle of Britain. The Spitfire's combat ability and superb handling meant it was loved by British, Commonwealth and American pilots alike, leading to a level of global public recognition which is unparalleled amongst other aircraft - everyone recognises and connects with the iconic Spitfire. 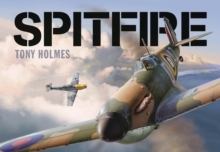 Spitfire is a complete reference guide to the world's most famous fighter aircraft, exploring its history, its strengths and weaknesses and its combat performance, using exciting full colour artwork and detailed illustrations throughout to create a premium, high quality product, combined with an affordable low price point.